The towns of Gibellina, Salaparuta and Poggioreale in western Sicily, Italy were struck with a 6.4 magnitude earthquake in the night of 14-15 January 1968 which not only caused heavy causalities amongst the populace but also severely damaged these towns and surrounding areas of the Belice Valley. There were about 380 dead with more than 1000 injured and 70,000 left homeless. The small town of Gibellina, founded in the fourteenth century, was almost totally flattened and the entire surviving population of about 6000 were relocated to a new township named Gibellina Nuova (New Gibellina). 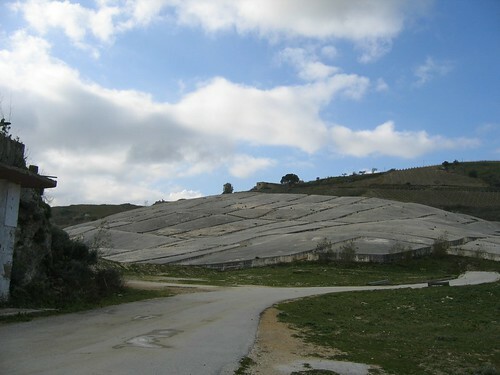 In September 1979 the city council of New Gibellina invited the Italian artist/sculptor Alberto Burri to create a memorial for the victims of the earthquake of the old city, which is now referred as Ruderi di Gibellina (Ruins of Gibellina). He decided to cover the entire Ruderi di Gibellina with concrete, leaving the old streets intact. The resulting memorial is known as Cretto di Burri aka as Cretto di Gibellina (cretto means crack). The memorial which is reportedly World's largest memorial measuring about 400 metres x 300 metres, was built block by block. Each section was surrounded with reinforced concrete walls about 1.6 metres high and all the rubble/debris of that section were piled inside the walled enclosure and then covered with white cement concrete. The pathways between each block were also paved with white cement thus creating gullies of varying width from 1.5 to 4 metres. It was an enormous task and several times ran short of funds/labour, took several years in implementation. Work was started 1985 and was yet to be fully completed by 2006. Present status not known. Even army had to be called to assist in construction work. Several persons have described this enormous work of art - a folly. They feel that the effort and money which has been poured into the memorial could have been better utilised to help Gibellina's displaced residents. They also feel that maintaining it will also be costly. Already with passage of time the white has started to turn into grey and weeds have appeared at the joints. 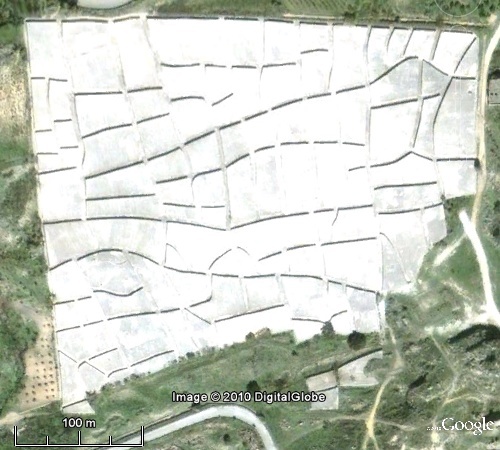 This is how the buried town looks in the latest (Oct. 2006 ) Google Earth imagery. Notice the pathways which look like a maze.